Warana is a name that distinctively stands ahead in Co-operative Movement and field of Education. It is the name associated to sugar, milk, malted food, paper, banking & consumer stores. Just 50 years ago Warananagar was an area deprived of all advancements, especially, in the field of education. Today one is astonished to see how this barren land is converted into an excruciating industrial & educational complex. It is still a green valley that smilingly welcomes all. The man who had brought about this metamorphosis is late Hon. 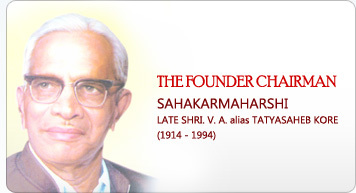 Shri V. A. alias Tatyasaheb Kore. He sacrificed his personal joys and stood determined to do the best and turned this land, which was once full of dacoits, into a prosperous township, a paradise in true sense. He was born on 17th Oct.1914 as a son of a farmer, in small village Kodoli. Being the eldest in the family, he had to shoulder the family esponsibilities. He actively participated in the Quit India Movement of 1942. He was closely associated to late Shri Yashwantrao Chavan, the former Deputy Prime Minister of India. Late Hon. Shri Tatyasaheb Kore rightly realized the need of providing education to the kit and kin of the farmers in rural area. He established Shree Warana Vibhag Shikshan Mandal, in 1964, since then the Shikshan Mandal took upon itself the need based endeavor of making education accessible to the poor and deserving. With sprawling campus of 100 acres, the Mandal houses Marathi and English Kindergartens, residential High-school, English Academy, Military Academy, Pharmacy College for Degree & Diploma, Jr. and Sr. Colleges of Arts, Commerce and Science, Institute of Engineering and Technology, Industrial Training Institute and well furnished hostels for boys and girls, quarters for teachers and non teaching staff.